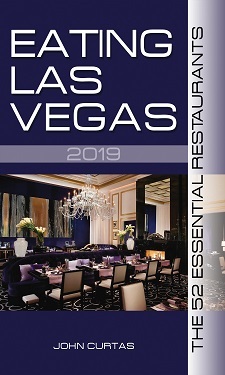 It’s not news that ELV eats out more than anyone in Las Vegas. In fact, so often are we in restaurants it’s hard for us to keep up with ourselves in posting about them. where we ordered up a few plates of gourmet bar food that pretty much sets the standard for chicken wings (with a killer blue cheese dressing), pigs in blankets (with housemade ketchup), and a burger that was just the right size (not too big or too small), finely ground, blood rare, juicy, and gooooood. And those addictive pretzels are nothing to shake a stick at either. on Jones near Spring Mountain (in a former Taco Bell). Yes, there is a god…and she has quite the sense of humor. Truth be told, we’ve been twice now, and in spite of the new decor, friendly staff, soft prices and easy-to-navigate menu, we find the food to be run of the mill. Not that bad, mind you, just not that good either. But the price is right, and that bland-looking egg custard dish (above) was a soft, barely set, silky smooth, and eggy delight. The next day we were hungry (imagine that?) so we remembered our promise to Bobby Flay to give his restaurant a second look. So off we went to Mesa Grill: [nggallery id=709] with Sarah “The Feldbergian” Feldberg to check out the vittles. True to our word, we approached our meal with an open mind. “What’s the thing we’d probably like the least,” was our thought as we perused the menu. “The mahi mahi….Yes!” we thought to ourselves. “We know we’re gonna hate it…so let’s see what the Flay-ster’s crew can do…” It may sound counter-intuitive, but setting yourself up for disappointment is sometimes the best way to give a kitchen a fair shake. We do it with beet dishes all the time. And you know what? The grilled fish was perfect, beautifully composed, and accented to a fare thee well with roasted pineapple-cascabel chile sauce, and a pineapple-green onion salsa. Everything was in balance, nothing overwhelmed the fish, but each flavor came through loud and clear. The Feldbergian pronounced herself only moderately satisfied with her chicken tacos, but we told her that was her fault for ordering something she thought she was going to like. at the next noon hour to see what satisfying sustenance those soothsayers of Serranos — Chef Mike Minor and the Two Hot Tamales — were sowing. Bold flavors have never been a problem here (unlike some awfully bland stuff we’ve been served at Mesa Grill), and that old reliable, the Baja ceviche, is always good to recalibrate the palate. Bright, fishy (in a good way), acidic and spicy, it may be the best pick me up out there, and was followed by a shredded chicken salad that was a peppery delight in its own right, and our old standby, the cochinita pibil — achiote pork roasted in a banana leaf with red rice, black beans and a plantain orange salsa. About the only thing we don’t like about the Border Grill is that it isn’t closer to our house. before we tackle it for dinner. Like we said: We promised Boy-Meets-Grill-Bobby we’d give it a fair shot before hanging another formal review on it, and so we will. This lunch (with The Frugal Foodie) had its ups and downs, and we can’t say we were all that thrilled with our sorta dry Cuban sandwich, or her unwieldy salad, but the steak tartare brought some serious Southwestern heat (even if it was a bit cold — indicating pre-made and time spent in the fridge), and the coconut cake was moist, plenty coconutty, and delish. Aside from the headache they gave ELV, there’s no faulting the drinks here either. I really need to head back to Border Grill soon. I think lunch is calling! I think you should give Wendy’s Noodle Cafe another go. Their cuisine is Hong Kong / Southern Cantonese street vendor foods, not fancy gourmet. This means plenty of subtle flavor blended from seafood, soup stock, aromatic herbs, mushrooms and other non-pungent flavorings. We went there this weekend and tried their salt-n-pepper shrimp (not a subtle dish) as our appetizer. I’ve tasted this dish at over 50 other Chinese restaurants in the States and South East Asia, and I consider their version in the top 5. We also tried their signature noodle soup bowl. I haven’t tasted that flavor since Singapore street vendors lunches.